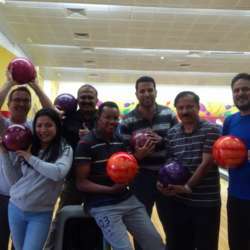 You must be a member of the Doha Bowling Group to attend this activity. Would you like to join this group? Please charge battery of fun and entertainment, no matter you are expert or would like to just try. Feel free to invite your friends to sign up in our activity. Please don't sign up if you are not willing to come. -Thob & Abaya and short above the knee not allowed. To know more, please visit QBC's website! Please come before the time within 15 minutes, to avoid wasting our game time. Wish a happy time for all of you.